Hills, mountains, passes, gaps, “the road to your house” (or whatever else one calls a road that climbs) often strike fear and anxiety in cyclists’ hearts and minds. This is especially true for new cyclists who often do anything they can to avoid them while out on a ride. IF THIS IS YOU, KEEP READING! Once one has the proper gearing on their bike, knows how to effectively use all of those gears, and has a strategy for climbing – riding up hills can be fun, easy, and open up a world of cycling that many riders are missing. HOW DO I KNOW THIS? 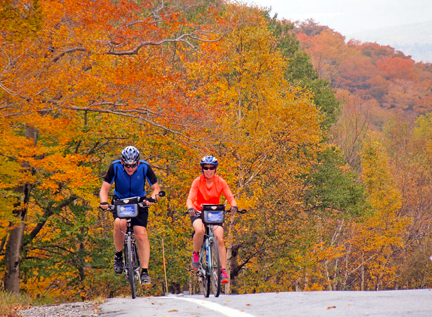 Well, besides being a lifelong cyclist, I have spent the last 13 years leading inn-to-inn bike tours with Discovery Bicycle Tours, and have taught hundreds of inexperienced, and some experienced, bike riders to ride comfortably up hills that they never before thought possible. There are several simple concepts to keep in mind that will help one ride comfortably up hill on a bike. 1) Accept the fact that the hill is in your life, and that the objective is not to ride up the hill as fast as you can to “get it over with”. This is the largest mistake many riders make. I would suggest making your objective to see how slow and comfortably you can ride up the hill. Also, don’t make the mistake of trying to match the speed of a faster rider who you might be riding with. Tell them to wait for you at the top! If they don’t want to do that, find some new riding partners! 2) Get into your lowest chainring before you start climbing the hill. Then all you have to worry about is your right hand which controls your rear gears. Then, in quick succession, quickly shift to your lowest gear, and see how slowly you can pedal your bike up the hill in your easiest gear. Do not equate easy pedaling with spinning your pedals quickly. That will just get you out of breath quickly. 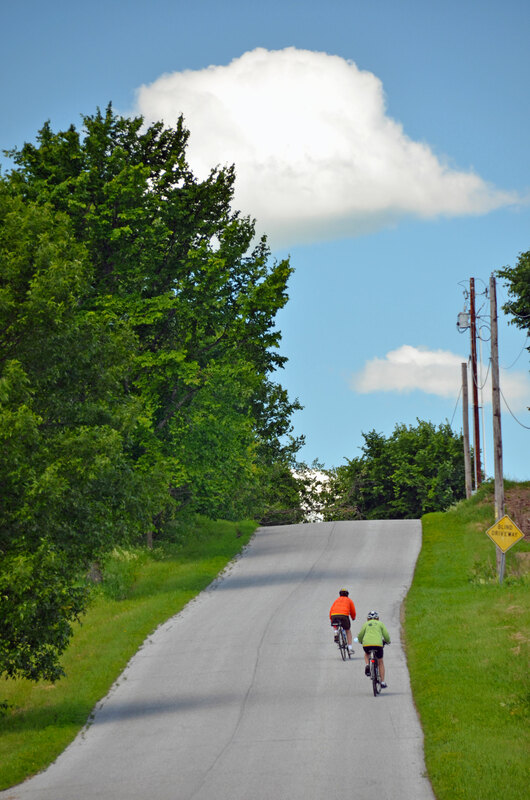 The objective is to pedal at a slow cadence, in a low gear, until you get to the top! Think about it this way – riding your bike in your lowest gear is the physical equivalent of walking slowly up the Washington Monument one step at a time while chatting with a friend – it’s easy. Spinning your pedal at a high cadence while in a low gear is the equivalent of running up the Washington monument one step at a time. What happens to your body then? You get out of breath and can’t do it (unless you are very highly trained!) And most of us are not highly trained athletes. And yet, we are capable of doing an amazing amount of work as long as we pace ourselves. Slow and steady wins the day! 3) On any hill, other than one that is very small, do not accelerate into the bottom of the hill with the expectation that the momentum you gain will help you up the hill. Any momentum you gain will be quickly dissipated in the first hundred yards of the hill, and you will find yourself out of breath from the early effort. Your body (cardiovascular system) much prefers a low level, steady state of activity. So just ride your bike at a leisurely pace into the hill. 4) Use all of your gears. Don’t save your two lowest gears in reserve “in case you need them”. You paid for them! Use them! My mantras are, “shift early, shift often”, and “ride in a gear that feels good, and that you feel you could comfortably pedal for a long time,…..like an hour”. If after even a few pedal strokes the pedaling is still too hard, keep shifting to a lower gear until you find one you like! Biking is supposed to be fun, not a forced march. 5) If you get tired, STOP and REST!! There is no law in bicycling that says one cannot take a break during a climb! While you’re enjoying a rest and a drink, don’t forget to step off the road so it’s easy and safe for cars to pass you. And remember to turn around and look back from where you came. It’s probably a great view that you might not see otherwise! Climbing is often as much a mental test as a physical one. Consider setting a series of small attainable goals as you climb, such as every other telephone pole along the road, rather than always looking for the top of the climb. Take the opportunity to be in the moment. Some of my best thinking happens while I am on a long climb. I hope these few tips are helpful to you as you get out for your rides this season. There are lots of great things about riding up hills and mountains – such as the view from the top, the satisfaction of making the climb with style and grace, and best of all, the ride DOWN! Oh, and remember to check you brakes before you start speeding down the hill! And finally, if you want someone to ride slowly up, and quickly down, the beautiful hills of New England (or Quebec, Maine, Scotland, etc…! ), come join us on a Discovery Bicycle Tour! We promise we will take you on some beautiful climbs! This entry was posted in Cycling Tips and tagged Acadia, adventure, Bar Harbor, bicycle, bicycle tours, bicycling, bike, bike touring, biking, California, Cape Cod, Chesapeake Bay, climbing hills, Connemara, County Clare, cycling, cycling hills, Discovery Bicycle Tours, downhills, Eastern Shore of Maryland, Eastern Townships, El Camino de Santiago, fall foliage, hill climbing, How to ride hills and enjoy them!, inn-to-inn bicycle tours, Ireland, Italy, Maine, maple syrup, Martha's Vineyard, Maryland, OUTDOOR ADVENTURE, OUTDOOR DINING, pedal strokes, pedaling, pedals, Puglia, Quebec, Santiago, Santiago de Compostela, Scotland, Slow and steady wins the day, Sonoma, Southwest Harbor, Spain, spinning, Sports, sugar maple, sugar maples, Travel, Tuscany, uphills, vermont, vermont vacations, Washington Monument, weekend getaways, Wine. Bookmark the permalink. 1 Response to How to ride hills and enjoy them!